NETWORK FINALS: ABC’s NBA FINALS game adjusted to 6.0 (and JIMMY KIMMEL LIVE adjusted down to 1.0), and FOX’s COPA AMERICA matches adjusted to 0.4. Elsewhere, both the new and rerun episodes of MASTERS OF ILLUSION lost 0.1 in final numbers, as did the rerun of AMERICA’S GOT TALENT. CABLE HIGHLIGHTS: Discovery’s ALASKAN BUSH PEOPLE led Friday cable, down 0.02 to 0.66. Univision’s Spanish-language coverage of the Argentina vs. Panama COPA AMERICA match was at 0.41, with the earlier Chile vs. Bolivia match at 0.22. Nickelodeon’s LOUD HOUSE hit the Top 10 at 0.36, with lead-outs HARVEY BEAKS at 0.29 and ALVINNN!!! AND THE CHIPMUNKS at 0.25. Disney Channel’s GIRL MEETS WORLD fell 0.09 from last Friday to 0.33, with lead-in STUCK IN THE MIDDLE at 0.24 and lead-out BACKSTAGE at 0.20. We’s MARRIAGE BOOT CAMP lost 0.03 to 0.36. 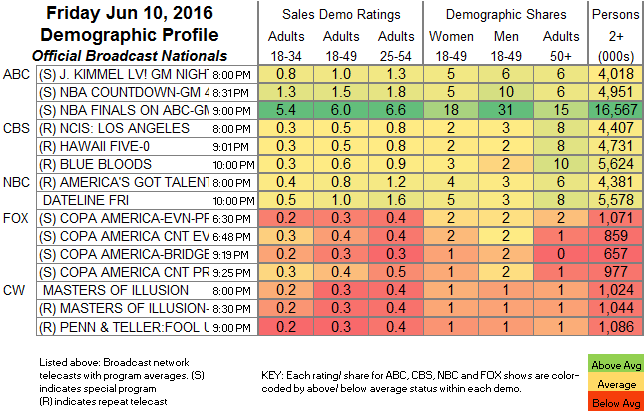 Food Network’s DINERS, DRIVE-INS & DIVES was steady at 0.31. HBO’s REAL TIME WITH BILL MAHER ticked down to 0.31, and lead-out VICE was down 0.05 to 0.18. History’s ANCIENT ALIENS was at 0.28. 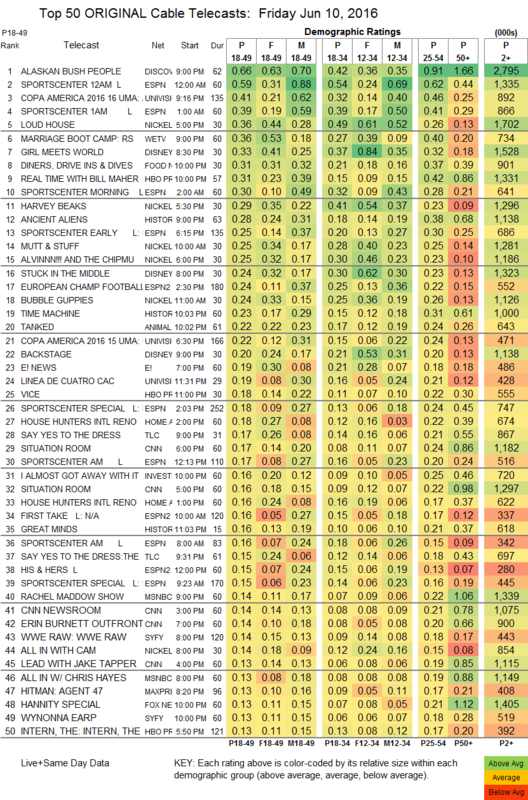 TLC’s SAY YES TO THE DRESS was at 0.17/0.15, compared to last week’s 0.22/0.17. On Syfy, WWE was up a tick to 0.14, and WYNONNA EARP held at 0.13. Cinemax’s OUTCAST, this time with an episode that hadn’t been previously available online, grew by only a hundredth to 0.07.